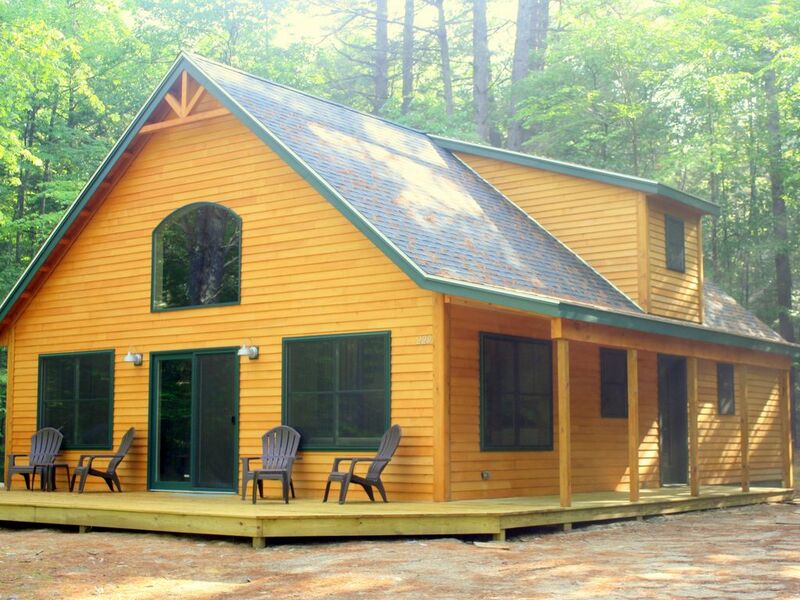 Come stay in our custom- built quintessential Maine cabin. Nestled in the woods, yet just a short walk to your own waterfront dock that is 400 feet down the private road. Located near the end of a dead end road, with only trespassing allowed to residents. Completely private, serene, and peaceful. If you have a boat with you, there is a boat launch conveniently located right on Highland Lake, and you are welcome to pull it up to your private dock. In the summer, you can see the water through the trees from the upstairs loft, and in the winter you can see the lights across the lake when Shawnee Peak has night skiing. Comfortably sleeps up to 8. Two private bedrooms; one with queen size bed, other with full size bed. Large Loft that looks past trees out onto Highland Lake. Two twin size beds and a queen size pull out sofa. Two full baths; one downstairs, and one upstairs off of the loft. Fully stocked with dishes, cookware, bath towels, etc. Bridgton is centrally located with many restaurants, drive-in and sit-down movie theaters, antique stores and shops close by. A 30 minute drive to North Conway or Sunday River, a 5 minute trip to Shawnee Peak, make this is the perfect winter location to enjoy skiing, snowmobiling, cross country skiing and ice fishing. Quiet lakeside Maine camp. Has all the amenities and views for a relaxing getaway. Huge deck for grilling. Dock access for watching the kids play in the lake by day and to listening to the loons and stargazing at night. Local activities include swimming, canoeing, boating, golf, fishing, hiking, biking, mountain biking, camping, shopping, antique shops, downhill skiing, cross country skiing, snowshoeing, snowmobiling, and seasonal hunting. Kayaks and canoes can be rented locally, and even delivered to your dock if you wish. Can bring your own boat, and bring it in to the boat launch. This little, beautiful cabin is tucked away near a lake. We only stayed at the cabin for one night. The cabin is very clean and minutes away from a lake. Check-in and Check-out were very easy and the owner was very accommodating for our needs. I definitely recommend staying here. We were in Maine for a ski weekend. The location was perfect and the house beautiful. We had plenty of room to spread out. Great for a family get away. During our visit, we had a few questions, which the owner addressed promptly. We highly recommend and look forward to another visit in the future. Excellent rental, everything we needed, very clean, owner was attentive and prompt in replying. Very comfortable and clean . The remotes need batteries and a clearer instructions to the water. Over all it was great. My husband wanted to fish near the cottage which was a priority but could not find the road after several attempts. One of the renters actually was annoyed he walked on “ their rental property to fish”. He ended up fishing from the boat docking place. Bridgton is a quaint New England town with excellent shopping, dining, and cultural attractions abound. Just seven minutes away is great hiking and sightseeing at Pleasant Mountain, home to Maine's third largest ski area, Shawnee Peak. Less than 30 minutes beyond that takes you to the White Mountains National Forest in New Hampshire, and the many mountains, trails, and glacial creations in that region. We have several 18-hole golf courses within 25 minutes of the Resort, including the scenic and challenging Bridgton Highlands Country Club just 3 miles away (with discounts for our guests)! Looking for antiques and collectibles? Want to visit Portland or L.L. Bean up in Freeport? Or do some outlet shopping in nearby North Conway, NH? All are easy day trips of from a half hour to an hour and a half away! So are the quintessential Maine seaside villages, as well. But to truly unwind and relax, you need to discover the many, museums, art galleries, restaurants, and the amazing shops of the Bridgton area.